Sign up for larps here. Google maps of the locations here. Underneath, you can see the program and schedule for AWiF 2016. Have Coffee and Hang Out. One AWiF organiser is present if you have questions or need something. All tours start from Headquarters at the time of the program start. Kiasma tour, political Art, then beer. Free entry. No Guided tour. After this we go together to (Sub)mersion Workshop. Sightseeing / Suomenlinna Sea Fortress, an UNESCO site. Depending of weather, either sledding or visit to Museum of Technology, Helsinki. Cocoa included. Description: 1.00€ per person, civil defense during the war years as well as the past and present of civil defense. The tour take 1 hour, after that we can freely move towards the harbour and the cruise ship. Dwa.trois is a mini-larp for four players in a car on the road, driven by the game master. Four burglars fleeing from a crime scene to the airport dealing with the fact the stuff didn’t work out as planned. The morning after a party is always a surprise - a splitting headache is soon forgotten when one wakes up all alone in a dark room. Or are you alone after all? Who are the other people present, why on earth are you here, and, -most of all- what now? This is a horror larp for eight people with a twist, played entirely in the dark. Note: Do not signup for this game if you have a) A severe latex allergy (there are latex props in the game and its dark, so you will most likely not find out about them until you touch them.) b) Severe anxiety over issues such as darkness, enclosed spaces or being touched. The Zombie apocalypse has come! No-one knows how it started, or where, or why. But the dead have risen, and are hungry for the brains of the living. A small group of survivors have found themselves trapped in a room, with only each other for company, and a horde of walking corpses outside. And now the real battle for survival begins - with each other. A two hour freeform minilarp for up to 10 players. Location: Lapinlahti, Lapinlahdentie 2, 00180 Helsinki. Price: EUR 25 € Sign up will open February 1st. A larp set in the "One World of Darkness" by White Wolf Publishing. Join us for an evening of vampiric fun and powerplay. Who will survive until morning? This is the official Prelude for the planned "Lair of The Hidden", A grand Vampire: The Masquerade LARP to be announced in 2016. End of the Line is a vampire larp designed from the ground up to utilize the best elements from Nordic Larp, to give you an intense personal experience. You will be cast as either one of the Kindred or a mortal and step into a World of Darkness that just might be the world we already live in. Read more here and at our Facebook page. Created by Bjarke Pedersen, Kasper Sjøgren, Juhana Pettersson & Martin Ericsson. The alarms are going off like crazy, the skies are red! What on earth is this? Jump into your hovercar and race to the vault as one of the priviledged people who Had A Spot At Salvation. Though this is the millionth time in a month, THIS TIME it just might be _IT_. A small larp for 23 people set in the alternative reality of the Fallout Universe by Black Isle Studios (and after that, Bethesda Software), in the year 2077. Player slots: max 23, min 11. Location: Ida Aalbergin Sauna, Ida Aalbergintie 1, Helsinki, under the Ida bar. Doors open 18:00, programme 19-20, 21:00 onwards party. The one-day course will include subtopics like "Swim towards the light" and "Island Profile Recognition", wherein we learn the importance of shortest path first routing. Both courses feature darktime environments and use, for example, cutout shapes of deserted islands in the Finnish-Swedish archipelago. Before and after the workshop, we will enjoy the well known Finnish sauna party environment. Bring your own towel, swimming gear and drinkables. Metal covers of computer game soundtracks. ”The Fast-Drinking Property Trading Game”. Well, it is not a Ski Resort, but what is a visit to Finland without an After Ski Sauna Party? Steaming hot cocoa with Minttu? The same old stories about that one time when someone fell badly and the first aid personnel arrived with a reindeer? And that one guy who insists of walking around with his snowboard? Come and join the party where wearing your winter overalls inside is a fashion statement no one will question. Bring your own towel and drinkables. Launch party of this table-top roleplaying game targeted for kids and beginners. It would not be a proper Solmukohta if it did not start with the unveiling of the fabulous Solmubooks. Between A Week in Finland and Solmukohta, we will have a soft start into the cruise experience with the release party for the Solmubooks: Larp Realia and Larp Politics. The will be moderate speechifying in this semi-standing reception. After the release party, enjoy yourselves with free mingling in the spaces and establishments the cruise ship offers. Hang Out, play boardgames and enjoy yourself at the Headquarters. Arcade gaming hall, old Games and good feeling. 7.50€ per person. 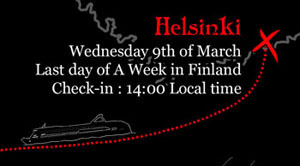 Edularp Conference Helsinki 2016 is the 3rd annual edularp conference. All the previous conferences have been part of the Nordic Larp conference Solmukohta and brought edularp professionals, larpers, teachers and other people interested in the form all over the world together. Extra: Freeform lounging and evening gathering afterwards. Get to know locations for AWiF 2016 here.